Circle are holding a workshop tonight in the meeting hall at 630pm. Lots of residents probably did not get an invitation because Circle’s regen team have chosen to remove many in Ravensbury from the future workshops etc. So head over to the hall now if you want to see what’s going on. There’s another in March too. Very interesting report on Accumulation by Dispossession using Myatts Field North as a case study. 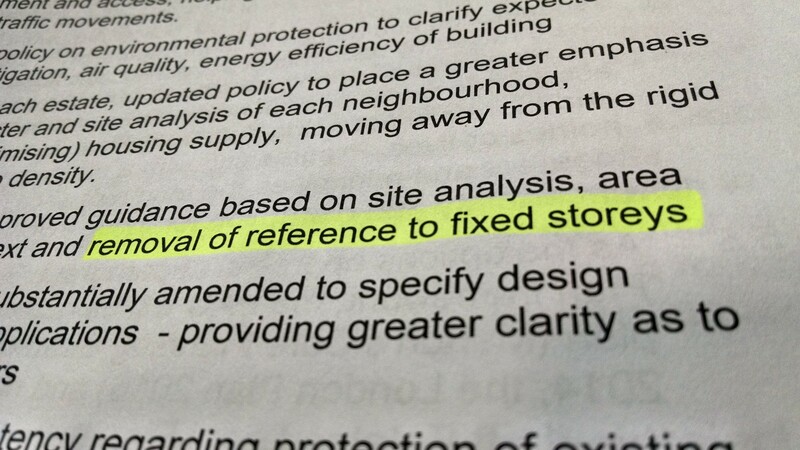 Cressingham Gardens homeowners, and any others undergoing a Lambeth council regeneration, would be well-advised to study a report which exposes the shocking property undervaluations and broken promises suffered by homeowners on Myatts Field North, who have faced the demolition of their homes. 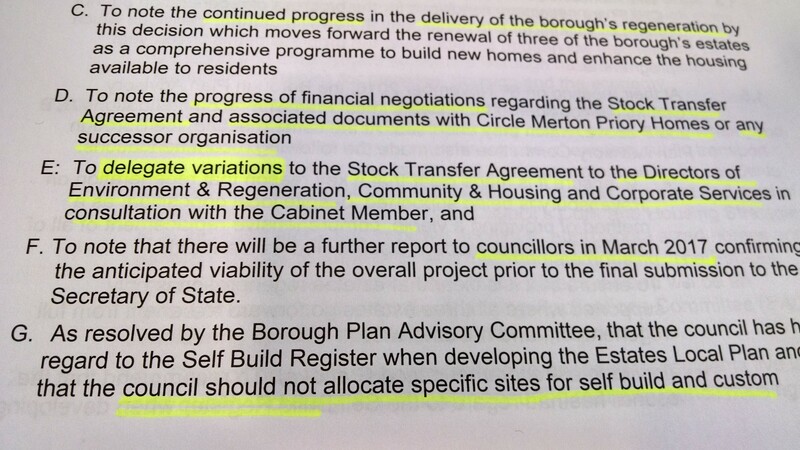 Lambeth council continues to applaud the scheme, now rebranded ‘Oval Quarter’, but the research uncovers a different story which might help inform Cressingham residents as they weigh up the council’s offer to them. Most residents feel that the very community of Ravensbury and the beautiful village-like environment in which we live is under threat from the demolition plans made by Circle Housing. No mention has been made by their consultation teams to retain the character and general environment that we at Ravensbury have enjoyed for several generations. Instead most events have concentrated on increasing density against the wishes of the residents. It’s a one way conversation based on a take it or be damned approach. So far, some members of our community have been bullied into leaving and others feel that they should leave before Circle Housing and their bulldozers roll in. You have to see Ravensbury Grove and the surroundings to believe it. Nestled between two parks, the atmosphere is usually tranquil and relaxing – a bit like being in the countryside in many respects. 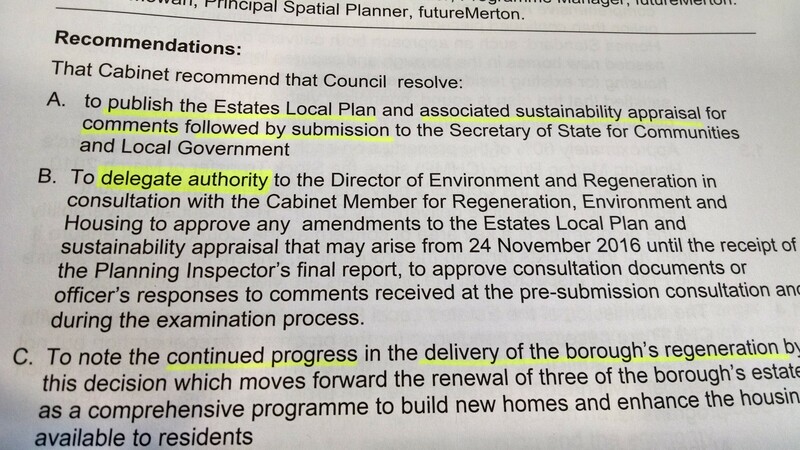 It’s part of the Wandle Valley Conservation Area according to Merton Council’s publications. I guess that as council tenants or ex tenants, we were always very grateful for such a nice place to live. However this summer, Merton Priory Homes (aka Circle Anglia) chose to wreck all that by inviting us to small workshops under a marquee in August (how twee) to tell us how they’d like to level the whole area and start again. It’s just that they’d like our opinion first – probably because otherwise they’d be taken to court for insufficient consultation. This pathetic attempt at consultation provoked a lot of anger, especially when they let it slip that regeneration requires a doubling of the housing density and the selling off of some of the land. 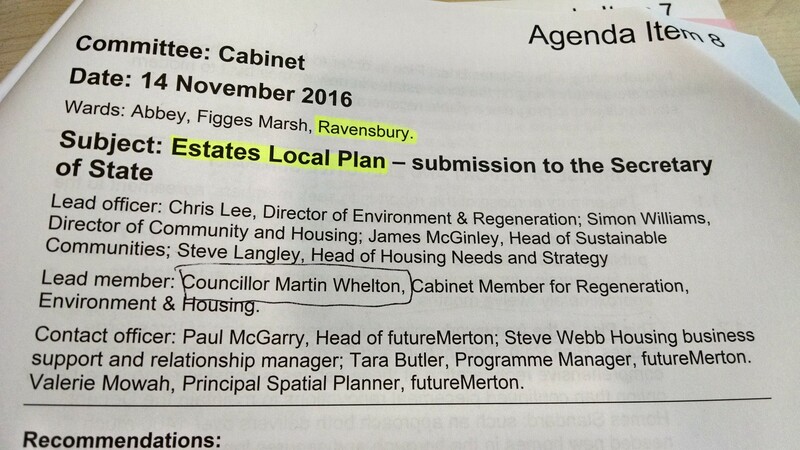 Circle AngliaCircle Housing Groupcouncil tenantsdegenerateHousinghousing densitymerton councilMerton Priory HomesMitchamRavensbury Groveregeneration "ravensbury grove"